Passengrent. Located 11 miles west of downtown, Louis Armstrong International Airport is a common place to find yourself stuck, whether you’re waiting for a friend to pick you up or testing the limits of your flight’s arrival. While you wait, enjoy the amenities and services provided by the staff, from the colorful art sprawled across the facility’s walls to the sights and sounds at the many restaurants and shops. 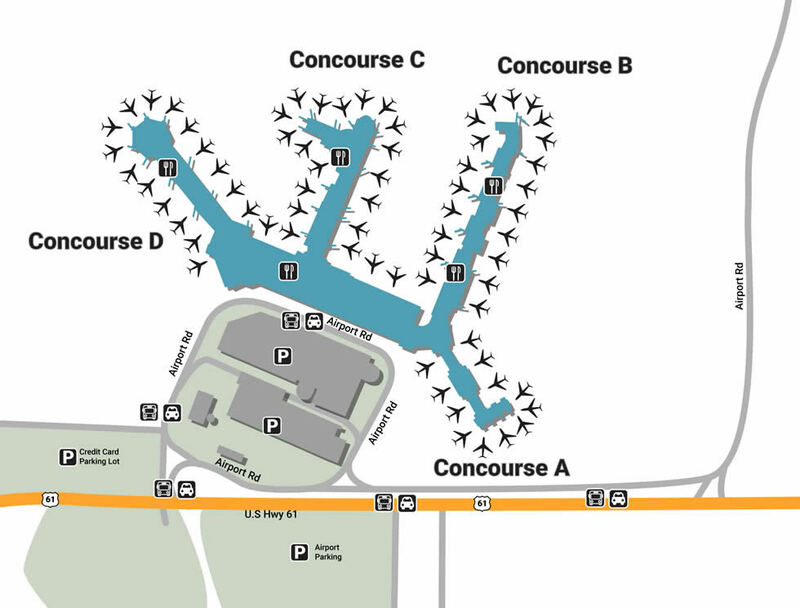 There are a variety of parking lots located throughout the facility, the closest being the Short-Term Garage, which connects to Terminals B and D via sky bridge. Those in need of long-term parking should head to the Long-Term Garage, which connects to Short-Term via sky bridge as well. The Long-Term Garage has two entrances, both of which are on Airport Access Road. The Credit Card Lot is the furthest from the airport, offering a very low rate, but at the cost of having to walk to Louis Armstrong International without the assistance of a shuttle. If you need to do a quick pick-up, head to the nearby Cell Phone Lot, which offers the first hour free - it is located on the corner of Airline Drive and Hollande Street. With a beautiful design and helpful services, relief awaits every corner at Louis Armstrong. There are several charging stations that are free to use, many of which come with clean desktops as well as complimentary Wi-Fi. For those in need of a currency exchange, head to the Travelex booth located near United and Delta in the West Terminal. There are also special facilities for the disabled, including paging throughout the airport and accessible ramps that make everywhere easy to go. Mothers in need of a break can find relief at one of the several Mother’s Rooms throughout the facility. Home to eccentric artists and handcrafted goods, it’s not hard to find something interesting in NOLA, especially when you arrive to the airport. If you need to pick up a quick gift, head to Terminal C for an interesting variety that includes Westin News & Gifts and Hudson Booksellers. Grab a specialty souvenir at Jazz Essence near Terminal A, or continue shopping at the official New Orleans Saints Store. Terminal A is also home to InMotion Entertainment, a tech store full of helpful gadgets and multi-media entertainment. Whether you’re in the mood for classic American or some down-home Creole, you’ll find the music and flavors of Bourbon Street at the heart of the airport. Head to the Terminal B food court for amazing eats, from the savory pizza at French Market Pizzeria to the local desserts at Praline Connection. If you’re in the mood for live music while you eat, get the full experience at Terminal C’s Jazz Alley Bar, or enjoy the tranquil silence at Atrium Bar right across the way. If you find yourself hungry and in the Terminal D food court, enjoy a classic American burger at Ye Olde College Inn Restaurant & Bar, or enjoy a slice of cheesecake at Copeland’s Bistro Scoop Cafe.